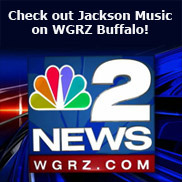 Jackson Music is your Buffalo area local guitar store! 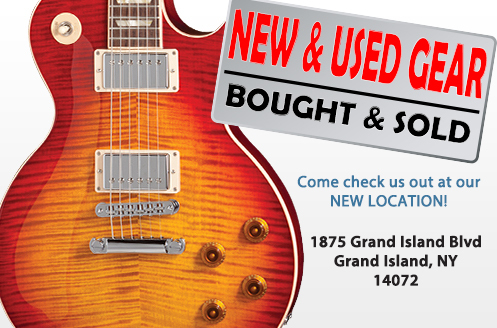 Located on Grand Island New York, our huge guitar selection draws musicians from Canada, Niagara Falls, Buffalo, Rochester, and around the country! Jackson Music Centre has been family owned and operated since the day we opened our doors in 1984. Dedication to the needs of our customers. Whether you’re a beginning guitarist or a touring professional, “We Have Your Next Guitar”. We take a ton of trade-ins, out right buy your gear, and even sell your gear on consignment! Come on down and try some out! We see a ton of new and used guitar gear everday here at Jackson Music. Names like Fender, Gibson, Martin, and many more. Check out a full list of music equipment brands we carry. We are located smack in the middle between Buffalo and Niagara Falls and just minutes from Canada. To see some of our latest used gear deals, check out our listings on Craigslist.